One of the key parts of organising an event is dividing up work and who does what. Role Bingo helps a group agree what needs to be done, and makes allocating tasks less formal, and more fun. 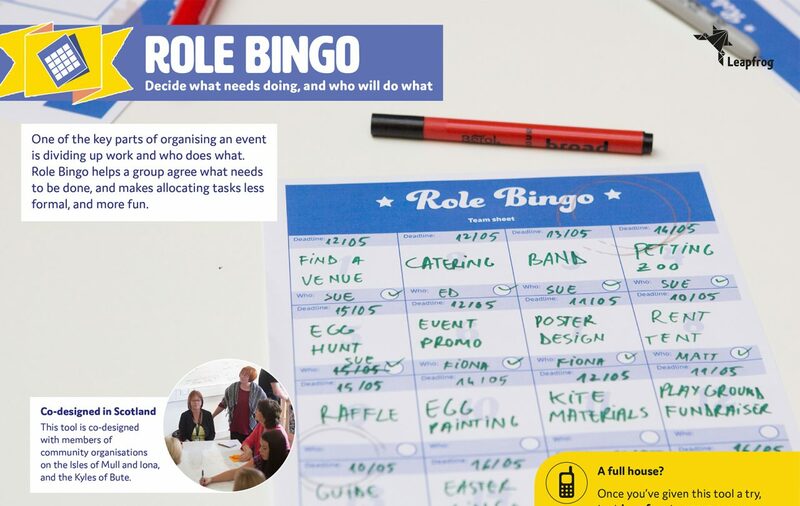 Role bingo helps you plan out all the tasks needed to make an event a success. Decide as a group what tasks need to be done and write each task in one of the bingo sheet squares. Divide and allocate tasks between a group and when they’re done cross then off your sheet! Role Bingo was co-​designed with members of community organisations on the Isles of Mull and Iona, and the Kyles of Bute.